RDM6300 125KHz card reader mini-module (HCRFID0006) is designed for reading code from 125KHz (ID) compatible read-only tags and read/write cards. It can be applied in office/home security, personal identification, access control, anti-forgery, interactive toy and production control systems etc. The reader will output id code of any compatible tag placed with within range via its serial UART interface. The reader requires no software interaction and can be interfaced directly to a microcontroller or to a PC via a serial port interface such as a USB to serial adaptor (also available via our website). 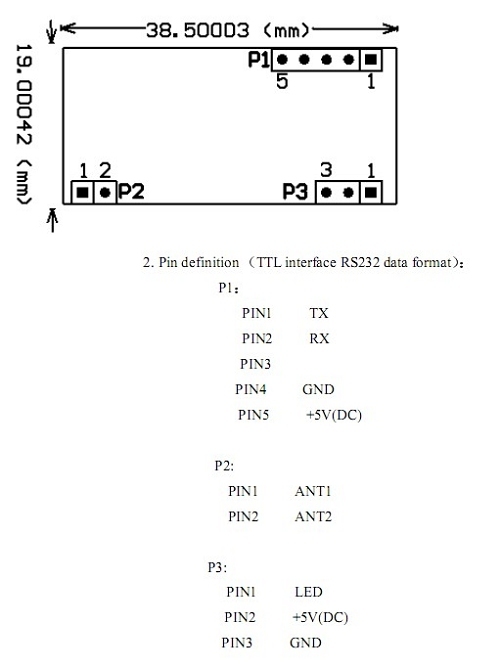 Could you clarify power to the board, is that 5v on (P1, pin 5) or (P3, pin 2) ? Either 5V power pin will do, they are connected together. What is the LED pin for ? It allows an LED to be connected to act as an indicator. There is a 100 ohm pullup resistor connected from 5V to this pin. The pin is momentarily pulled low whenever a card or tag is in range. You can connect the anode (+ve) of an LED to this pin and the cathode (-ve) to the GND pin. The LED will be illuminated when no tag is in range and will continuously blink when a tag is in range. However we've found to be quite short (about 1ms) so its only just visible. If you are using it with a microcontroller we'd recommend using it to control an LED instead. The up to 15 CM spec comes from the manufacture and I would suspect the range is dependent on the sensitivity of the tags used. Especially passive ones. Normally with an RFID reader you wouldn't want a good range because for example you don't wan't it reading a tag in the pocket of a person walking past. There are a few basic things you can do like making sure that antenna is placed as far away from metallic objects as possible and adjusting its orientation for best range. Another thing would be to experiment with creating your own antenna but this is a bit of a black art. Beyond this I think you would just need a more sensitive tags. Hi, I notice that this uses TX and RX pins. I recently bought the Hobby Components Uno R3 and wondered if you can just hook this up to digital pins 0 and 1 directly or is there some other component needed? Then you just start the Serial with Serial.begin(9600) and listen for data with Serial.available()? Is there some way to see the read data back on the computer during debugging as you're obviously using the serial interface already? Thanks for any help you can give. Hobby Components Uno R3 and wondered if you can just hook this up to digital pins 0 and 1 directly or is there some other component needed? Yes you can just connect it straight to the Arduino's serial pins. It will automatically output the card tag number whenever a card is in range so there is no need to connect the Arduinos Tx pin to it to use it, just the Rx pin. Is there some way to see the read data back on the computer during debugging as you're obviously using the serial interface already? The easiest way would be to add some code to echo back out on the Tx pin anything it receives on its Rx pin. It's a bit old now but it uses a software serial library to communicate with a Bluetooth module and then passes the received data out to the hardware serial port so this you see it in a terminal window. I am thinking about using this to create an intelligent cat flap. Has anybody successfully read a pets (cat) microchip with this? They usually operate on 134.2 KHz so I wonder if this would need tweaking the circuit. Is the circuit diagram available? Has anybody successfully read a pets (cat) microchip with this? I'm afraid it's very unlikely that this will work for a couple of reasons. First of all RFID is actually a generic term for any kind of ID device using a radio transmitter and receiver. There are many different systems and standards that come under the term RFID and the system that the chip inside your cat will be using won't be compatible with the systems used by this reader. I'm afraid it's also not possible to modify the frequency of this reader. It's operating frequency is generated internally within the IC and it's designed only to operate at 125KHz. You best option would be to try and find a reader that is specifically designed to read your cat's tag. However one thing to watch out for is these kind of devices work in very close proximity to the tag and so range may be an issue.